Miami Beach's turquoise warm waters and white sandy beaches make for a perfect backdrop for your beach wedding. Chose your beach of choice or trust your wedding planner with recommendations for a quiet and peaceful spot under Florida's warm sun. Your wedding officiant will meet you on the beach and guide you through your beach wedding ceremony in English or German. A bottle of sparkling wine to toast and a bridal bouquet made of red roses are included in your package. Getting married in Miami Beach is easy. 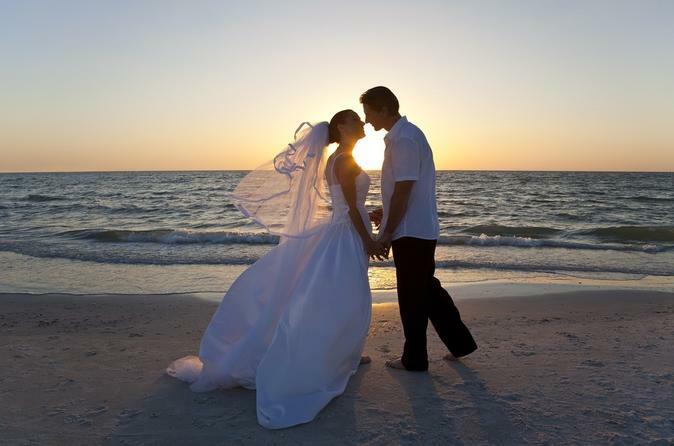 The beautiful beaches of Miami make for a perfect backdrop for your intimitate, small wedding. The services of your English or German speaking officiant, a bridal bouquet made of roses and a bottle of champagne are included in your package. You may chose any Miami Beach location of your choice for example your hotel beach or follow the recommendations of your wedding planner/officiant for very quiet and beautiful beach locations. A 30 minute photo session including 100 digital pictures are available on request at an additional cost (US$250.00).